Is your office properly equipped to deal with a fire emergency? In honor of upcoming Fire Prevention Week (October 5-11 this year!) and October as Fire Prevention Month, we’re featuring courses to keep your workplace safe from fire hazards. Fire Prevention Week dates back to 1920, when President Woodrow Wilson proclaimed the first National Fire Prevention Day to commemorate the Great Chicago Fire, which killed more than 250 people and left 100,000 homeless, and bring national awareness to fire safety. Since 1922, Fire Prevention Week has been observed around October 9th (from Sunday through Saturday of that week), the day the Fire did the most damage. Themes over the years include Play It Safe…Plan Your Escape, Prevent Cooking Fires: Watch What You Heat, and Know When to Go: React Fast to Fire. This year’s theme is Working Smoke Alarms Save Lives: Test Yours Every Month! Ensure your employees know how to respond in the event of a fire emergency with this 20-minute, comprehensive basic fire safety training course. Identifying fire hazards, knowing when to fight a fire, tips for putting out fires, and emergency fire protocol are all covered. Several OSHA regulations are touched on including hazard communication, hazardous waste operation, and personal protective equipment. 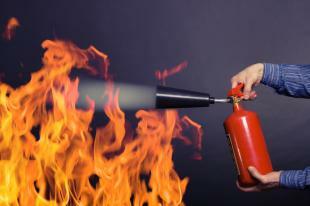 Does your office know how to properly use fire extinguishers? Fire is one of the most common workplace hazards, and it’s critical for employees to know how to use this important tool. Help your staff effectively choose and use fire extinguishers with this 23-minute course. Get informed about types of fire extinguishers (including Type “K”) and fire extinguisher inspection. Avoid fire risk and safely harness the power of electricity with this quick, 25-minute electrical overview course. You’ll be able to describe the atomic structure of matter, define electricity, and operate a simple circuit by the end! Don’t miss this important info about the characteristics of good conductors and insulators. OSHA requires all workplaces have the basic necessities to practice good fire safety. Ensure your team is ready to respond with this 20-minute, OSHA compliant course that will teach your employees about fire prevention, fire extinguishers, and emergency plans. The OSHA Fact Sheet “Workplace Fire Safety” is included.